The LadyBird sensor bowl, not only for humans but pets too! Stainless steel bowl inside a hard plastic exterior that is motion sensor activated. Especially in the summer time, cat and dog food don't stay fresh for long and if your pet doesn’t gobble it all up quickly it will lose its freshness, start to smell and attract flies! This can be rather stomach churning especially if you feed your dog or cat in the kitchen like many do. The LadyBird Sensor Pet Bowl has been designed with a lot of thought. It isn’t loud and abrupt to frighten your pet and the 2 AA batteries (included) will last for 10,000 cycles (open/closed). Many wonders if their pet will have trouble figuring out how to use the bowl. No. You may have to assist and guide your pet 2 or 3 times at the most and then it will be second nature to them. When your pet comes into close proximity to the top of the bowl with its snout, the bowl will open like a ladybird’s wings (see picture or video). 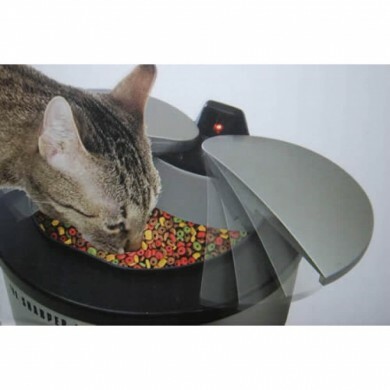 The bowl stays open giving the cat or dog access to the food or water inside the bowl while it’s eating or drinking because the motion sensor detects motion. When the pet crawls away from the bowl, it will close after 3 seconds keeping the food and water fresh and free from flies. Inside is a stainless steel removable dish. This means it is easy to wash or put in the dishwasher. It also means it will keep the food and water fresh and cool. The exterior of the bowl is durable hard ABS plastic. There is easy access to the battery compartment and there is an on/off switch under the bowl.